IT Portfolio Optimization Leads to….the Cloud? I’ve spent some blogging cycles this week talking about the evolution of IT portfolio selection processes – specifically that there is a natural maturity curve from what I am calling a tightly coupled model of fragmented IT delivery and a decoupled model of consolidated IT delivery. I’ve also pointed out that there’s almost a chicken-egg relationship between IT portfolio optimization and the IT funding model. The Microsoft account representative goes back to Redmond and chats with the Product Team. She goes back to our customer and with pinky firmly planted next to her lips does her best Dr. Evil impression by telling the customer that this can be done, “for 1 million dollars!” Chortle, chortle. Now, our customer is no dummy. He knows that while he needs this agile functionality, he doesn’t “need need” it. He can wait. He knows some other customer will step up and pay to develop the functionality he needs, and until then he’ll just make do. In fact, he’s read books on Game Theory, and knows that if he just waits long enough, he can reap the benefits of someone else’s investment. In the meantime, maybe he goes and buys something off the shelf that sort of meets his needs and doesn’t need to hit the IT radar. New features won’t get implemented until long after they’re actually desired. Business units play games to try to push the costs off on other units. The net result is that IT is playing catch up to the business. What about the alternative? In this case, and this is purely hypothetical, Microsoft has a large customer base for the product and bills by the user, say in some sort of arcane licensing scheme that only the high priests of the Temple of LAR understand. Microsoft can relatively accurately predict licensing revenue for the next year, and strategically decide to set aside a percentage of that revenue for further investments in the product. That sets the stage for the investment portfolio. Our customer again needs agile functionality, and again approaches the Microsoft account rep. This time, when she goes back to Redmond, the team agrees to throw the request into the feature backlog. When the annual planning cycle rolls around, they perform a survey of their top clients and prioritize the feature according to the results. The priority dictates where the feature falls in terms of absorbing a portion of the available investment portfolio. Assuming the feature is ranked high enough, the team develops it, and makes it available through the SA ritual practiced by the priests of LAR. This latter example is what I am calling a decoupled model. Features are developed and prioritized within the constraints of an investment portfolio, and not individually as requested by the business. Projects are bundled into logical programs that leverage economies of scale to deliver capabilities across multiple business units. The program bundling supports consolidated investment in the platforms upon which processes are enabled. …which means that to accommodate this economy of scale, we need to find a more mature IT funding model. Slicing and dicing our portfolio at the project level and funding at that level from our business units doesn’t enable us to get the consolidated benefits that a decoupled portfolio can deliver. Perhaps a user based revenue model doesn’t apply as many users end up not using the solution, or end up using the solution less than more advanced power users. In this world, to make things more equitable, we may need to find a different funding model, something like transactional costing. In transactional costing, the cost of developing and delivering the service is recovered using metering. The respective business units pay per use, and in return get a solid service and don’t have to worry about more complex cost models. Sound familiar? The logical conclusion of that decoupled model is the cloud based model. IT portfolio optimization maturity inevitably leads to the cloud or at least a cloud-like decoupled service model. Just an FYI that if you’re reading this post, you’re probably not reading it by e-mail. It looks like the WordPress e-mail subscription functionality is taking a personal day. In the meantime, hopefully this saves someone from spending time checking their spam folders. 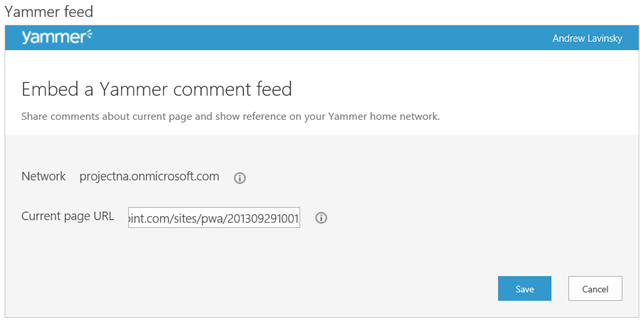 I could post the link to the WordPress forum discussing the issue, but let’s face it, it wouldn’t matter. You’ll know it’s back up and working when you start getting e-mails alerting you to new posts. In the meantime, I would encourage you to think about how today’s world is too reliant on e-mail – unless, of course, you’re not actually reading this, because, well, you rely on e-mail for your blog reading. In yesterday’s post, I introduced the concept of a tier 2 portfolio, and how the concept of strategic coupling works in a tiered portfolio. This post continues that discussion with an overview of a decoupled portfolio. A decoupled portfolio means that IT understands where the business is going, and instead of reacting to that, makes plans hand in hand with the business to achieve those goals. In a decoupled portfolio, the IT organization identifies a series of strategic drivers that guide investment programs to support the business. These investment programs, in turn, provide the governance framework to a series of projects that better position IT to deliver effective, efficient services to the business. IT is proactively identifying what the business will need, and preparing those capabilities in advance. These proactive efforts end up being bundled into programs, where each program is designed to enhance specific capabilities. As a secondary benefit of bundling efforts into programs, IT is better positioned to invest in options assessment, i.e. to invest in alternatives analysis to determine the optimal approach to developing a specific capability. The budget for such efforts may be attached to the program as opposed to waiting for business funding. There is significant investment in shared platforms to support business projects. Coordinated investment replaces piecemeal investment in shared platforms. In the absence of a defining business program structure, a decoupled portfolio naturally lends itself to the bundling of projects into logical programs defined by IT. These programs, in turn, provide a structure to the IT portfolio that enables it to both define funding priorities, and to approve these priorities within the program – thus providing a more agile governance structure. The challenge inherent in this rebundling of IT project work is that it necessitates a reassessment of the traditional IT funding model. In a tightly coupled IT environment, each project is owned by a business unit, and hence funding is easy to determine. In a decoupled portfolio, more investments tend to be made in an entire platform – that is then leveraged by multiple business units to achieve economies of scale. Thus, as IT organizations move to this decoupled model, a new funding model is necessary – either splitting the costs equally across business units, or more logically, moving to a transaction based costing model. This is the inevitable result of moving away from a coupled IT portfolio. Of course the issue with any framework is that it is overly simplistic. I’d no sooner finished writing this post when I started poking holes in it. For example, if tier 1 portfolios are defined in terms of what makes us a profit, and tier 2 portfolios support the people that provide the tier 1 services, then where does new product development (NPD) fit in? In alignment with the proposed framework, NPD is another tier 2 portfolio that is designed to generate the grist that goes into the tier 1 portfolio and makes a profit. The entire tier 1 and tier 2 thing may be a bit of a hazy line at some times. For example, what if I have an IT consulting shop that shares resources between internal and externally facing projects? Are those projects all one portfolio? Do I have two portfolios? I’ll defer to later posts for clarifying that question. Many times, we don’t even realize that we’re applying a classification scheme – until we take a step back and realize that we’re taking a totally different approach to the current organization than we did to the last organization. When those sorts of epiphanies happen, I like to sit back and identify intellectually why I adapted the approach and see if I can turn that into a theoretical framework. This post is the result of such an exercise. I tend to cross operational domains about once a year, typically bouncing back and forth between pipeline construction and IT portfolio management. Needless to say, these two domains seem to operate in entirely different worlds – with different priorities, operating goals, and differing concepts of velocity. When was the last time you heard an IT shop talk about dropping a developer into the project via helicopter to ensure you make your deadlines? When you talk to pipeliners about missions and portfolio optimization, you tend to get a blank stare. That’s usually because project decisions are often made by the Marketing folks. They work with customers to identify whether or not a new pipeline would be profitable, conduct feasibility studies, and then after all of that, they issue the marching orders to go build the pipeline. IT tends to struggle with its fundamental mission, often not able to articulate why, in fact, a project has been selected. That doesn’t mean though that all of IT operates significantly different than a pipeline company. For example, try going to an IT consulting shop one day and asking them how they select the projects they do. You’ll probably get the same answer as the pipeline company above: The salesperson made the sale. Delivery did a feasibility estimate. The consulting shop has chartered the project and expects to make a profit on it. A tier 1 organization is responsible for providing services directly to the organization’s customers, the people who pay money to the organization for the services it provides. Tier 2 organizations provide services to the tier 1 group, i.e. 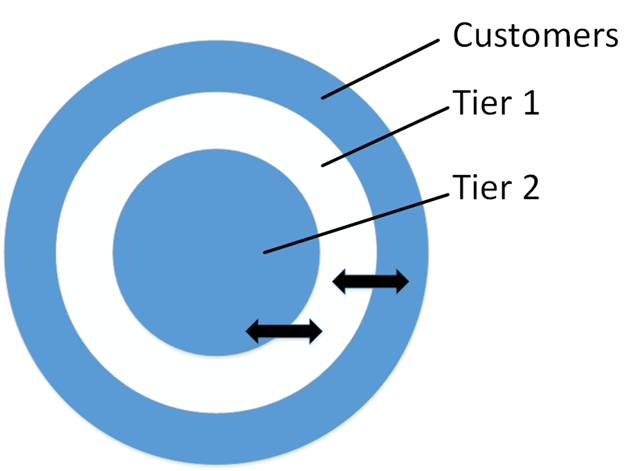 tier 2 provides the tools to enable tier 1 to generate value for the customers. I submit that a tier 1 portfolio, being directly responsible for the provision of profitable services to the external customers of the organization, has a much easier time of defining strategy. Essentially that’s whatever’s profitable and fits within the long term goals of the firm. It’s the tier 2 portfolios that are a bit more challenged. The tier 2 portfolios are charged with supporting the mission of the organization, i.e. facilitating the job of the tier 1 service provider. Hence, tier 2 portfolio optimization tends to suffer when the organizational strategy is poorly articulated. When you look at a traditional project portfolio selection process such as AHP, you’ll see that it almost invariably is targeting the tier 2 portfolios. You almost never see portfolio selection guidance applied to tier 1 portfolios. To Couple or Not to Couple…? Now we have the concept of a tiered portfolio defined, let’s take a look at another concept: the coupled portfolio vs. the decoupled portfolio. Many IT portfolios are tightly coupled with the business (tier 1) portfolio. This means that IT projects are chartered to directly support a business project. If the business plans Project A as part of the annual planning, IT plans an IT Project A. If business plans Project B, IT plans an IT Project B. IT is always reacting to the business needs and not proactively driving to meet forecasted needs. IT tends to not be able to invest in options analysis, i.e. it’s more difficult to set aside money to identify alternatives to achieve a specific goal, as the business is often not interested in investing in these optimization exercises. IT programs are poorly defined and often fragmented. There is often only a transitory acknowledgement that projects belong to programs, and those programs are the ones defined by the business. There is minimal investment in shared platforms to support business projects. Coordinated investment is replaced with piecemeal investment where the shared platform is only upgraded when the business is willing to attach the funding to a specific project. That’s what a coupled portfolio looks like. In my next post, I’ll talk about the implications of a decoupled portfolio.